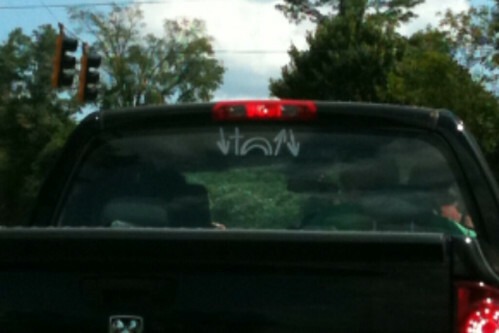 The other day Kati and I were driving behind this truck. It had these weird symbols on it’s back window. I assume it has something to do with Christ because of the cross. But we have been unable to figure out what the symbols are telling us. Down Arrow, Cross, Hump, Up Arrow, Down Arrow. My guess is the creed. Christ came to earth (down arrow) died according to the Scriptures (cross) was buried (arch is a tomb) rose again on the third day (up arrow) and is returning to judge the quick and the dead (down arrow). Alan, The rainbow was throwing me off too… great minds think alike? ooooooohhhhh! The arch is a tomb! I thought it was a rainbow, and that was throwing me off. i wonder if you can buy this sticker, and where from? I have no idea. I googled around for it when I was trying to figure out what it meant and wasn’t able to find any like it. If you do find one, please let us know :). I believe it is a kerusso company thing, but I could be wrong. Check your local christian book store. Ours has this on bracelets, bumper stickers and t-shirts. i have a bracelet with that on it. the arrow down is jesus coming to earth in human form, the cross resymbols the crucifiction of christ the tomb is the resurrection, the arrow up is jesus going up to heaven, and the final arrow down says that he will come again. does anyone know where you can get the bracelet with this on it?? anyone? check out Mardel.com :) I got mine at the store here at home. Good luck! I have been looking for this logo and found out it is from the “Witness Collection” and can be found at giftsfaith.com. Why do you feel like it is important to capitalize a reference to God or Jesus? Is there something in scripture that indicates that this is necessary (or important enough to ask others to do it)? May i ask the person who took this pic of the truck where was the pic take at city, state.. I believe it was somewhere around Athens, GA.
this is so crzy this is my moms old truck that big guy in the back is me and that is my dad in front of me and my mom which is driving…. we are always in athens dont live far form their, all the people at our church has that on the back of thier cars, we get to tell people tell people all the time what that means it is a great way of witness. Does anyone know where I can find a bracelet like that online? Does anybody know what the name of it is??? He came down (down arrow), He died on the cross (cross), He rose from the grave (arch), He ascended back to heaven (up arrow), He I coming back down (down arrow). Someone gave me a pocket token with these symbols and Googling for the meaning led me here. I’ll ask where he got it and post here is anyone is interested. Hey Alan Knox I thought it was a rainbow too hey that brian dude is a gienus. I love this symbol and am trying to find things with this on it…if anyone finds something, post it please! Thanks a bunch! has anyone ever seen this same thing done with the word love? this item can be obtained at catholicgiftsandmore.com…I just placed an order. The item # is 25s and if you are a first time shopper the promo code for $5 off is cpncgm5b. Happy shopping; glad I could help! It’s a cheat code for the Jesus Nintendo game. It makes it so you come back to life after you game over! All good Christians have a game controller with a cross button! kingswitness.com is the original website where you can get the bracelets! It’s a great website too with a guide to receiving Christ! So the arch is the tomb?! I have the bracelet and all this time I have been telling folks that it was a bridge because Christ bridged the gap between God and man. The last arrow obviously means he’s coming back but it could also mean that he did not leave us comfortless but sent us his spirit John 16:7. Excellent witness tool and conversation piece! So this is like the Konami code for Christ? Where to find the bumper sticker????? Hey! Most of what I see is correct, but we say something different for the arch. I’ve always heard it’s He came down, was crucified, overcame death (the arch/bridge symbol is overcame), He rose again, and He’s coming back. Many people are asking where to buy bumper stickers, my friend had several custom made for our church, so if you can find someone who custom makes things like that, they’re not hard and inexpensive! the arrow down-	He’s coming back. Me and my husband both just got this tattoo on our wrist last night. One of our friends have a tattoo of it,We thought is was amazing. So glad y’all posted all these comments! We saw this on a car for the first time tonight. (My husband had seen it once before.) As soon as I googled it – this website came up. Blessings to you all – thanks! You can actually just type in Jesus came He died He arose He ascended and He’s coming back decals and hit search and it pulled them up for like a $1.95 each they are really cheap. I love them I have the bracelets and a shirt.